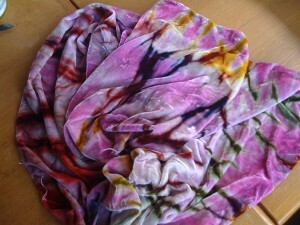 What do you get when you mix a velvet scarf, dyed with cranberry & turquoise remazol dyes, limited time, a brain that really isn’t focused on the task at hand, impatience, etc etc…. 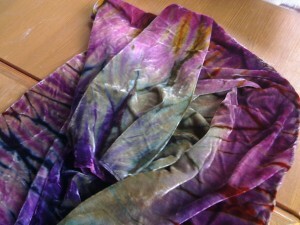 In a rush to get *something* done, anything really, I grabbed a handful of scarves I had dyed with liquid fiber reactives. The one above I believe was cranberry & turquoise. The one below was all cranberry. I had limited time & apparently limited focus. At first i couldn’t figure out why my discharge bath wasn’t heating up. (I had unplugged my hotplate set up). Then even when hot enough it didn’t seem to be working. So I started gradually (i thought) increasing the strength. Till i realized I had just doubled the amount of thiox, unintentionally, and WHAM- then it worked. Quickly stripping way more than intended. I was completely devastated since it was yet another “failure” in a long list of things that hadn’t been going well. And i just *didn’t have the time* to do it all over again. I peeked under the folds and realized it also hadn’t been compacted as much as I thought either. So resists weren’t tight. So, I grabbed some dye paste I had left from another project from right before, literally slapped it on the poles, stuck them in buckets, and forgot about them, OUTSIDE, where it’s about 45 at night for 2 days. Imagine my surprise when I went out to take the garbage out, and there are my little buckets, with the neglected poles. I picked the leaves off, started rinsing, pulled it off the pole and was shocked at the results. Colors I wouldn’t have ever really thought to put together had I “planned” it all out. The pinkish one below I was less impressed with, but the sister to these two is in my closet. mine mine mine. 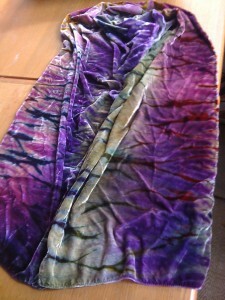 Dyed velvet, discharged, over dyed on pole. Now my goal is to try to in some way replicate these mistakes. Those Dye Gods, gotta love their sense of humor.